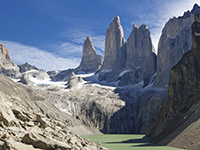 There are several attractions of great beauty to be seen in Chile, including Torres del Paine National Park and Valle de la Luna. Elsewhere, Chile boats astonishing man-made features such as La Moneda Palace and the Costanera Centre. Airplane is the only viable means of transport available from the United Kingdom to Chile, with the two countries separated by 7,452 miles. Flight times will inevitably be very long, regardless of where you are travelling to in Chile, with London to Santiago – Chile’s capital – requiring roughly between 17-22 hours of travel. You should discuss with your diabetes team beforehand how best to medicate for your diabetes whilst travelling. Chile is three hours behind Greenwich Mean Time, which should not majorly disrupt your diabetes management. The average climate in Chile is considerably different to that in the UK, with average temperatures between January-April and September-December above 20°C in several cities. However, in the traditional UK summer period, the temperature in Chile drops to a much more manageable level comparable to spring in the UK. Travellers visiting Chile outside of the summer period should prepare for extreme heat. If you take insulin, you should vigilantly monitor your blood sugar levels. Prolonged periods of activity, such as walking, can result in enhanced insulin absorption in hot weather so you could consider reducing your dosages when planning physical activity. The currency used in Chile is the Chilean Peso. ATMs are common in large cities and found in banks, shopping centres and pharmacies, among other establishments. Many of these machines permit the use of foreign bank cards, however, a charge will most likely occur. There are no mandatory vaccinations to enter Chile, however some are recommended. You should consult your doctor eight weeks prior to your departure in order to receive the vaccinations in time. Some travellers are also recommended to receive vaccinations for other diseases, including hepatitis B and rabies, which can be carried by dogs, bats and other mammals in Chile. It is advised to consult your doctor eight weeks before travelling to analyse whether you should receive any vaccinations. Otherwise, the opportunity should be taken to ensure existing vaccinations such as your yearly flu jab and those against polio and tetanus are also up to date. UK citizens with diabetes will not be entitled to any free medication services while in Chile. Securing comprehensive medical insurance will be essential in order to obtain even basic treatment. Diabetic medication is available in Chile, but payment will be required from all pharmacies, for which the Spanish translation is “Farmacia”. Urine testing kits are no longer common in Chile, but some equipment may be available in Santiago, Valparaiso and Conception. Blood testing equipment is otherwise more widely available. The emergency services telephone number to be called in Chile in the event is 131. It is advisable to contact the manufacturing company of your medication prior to leaving the UK to find out what is available in Chile if your medication gets lost, stolen or damaged. It is also worth checking to see what different names your medication may be listed as. Most syringes are available in Santiago, Valparaiso and Conception. The selection may be restricted in more remote areas. How is blood glucose measured in Chile? Blood glucose is measured in mg/dl in Chile. What language is spoken in Chile? Spanish. It will help you in your day-to-day activities to learn some basic phrases as English is not commonly spoken. What sugar free drinks are available in Chile? Diet Coke, Diet Spite and Diet Fanta, among others.